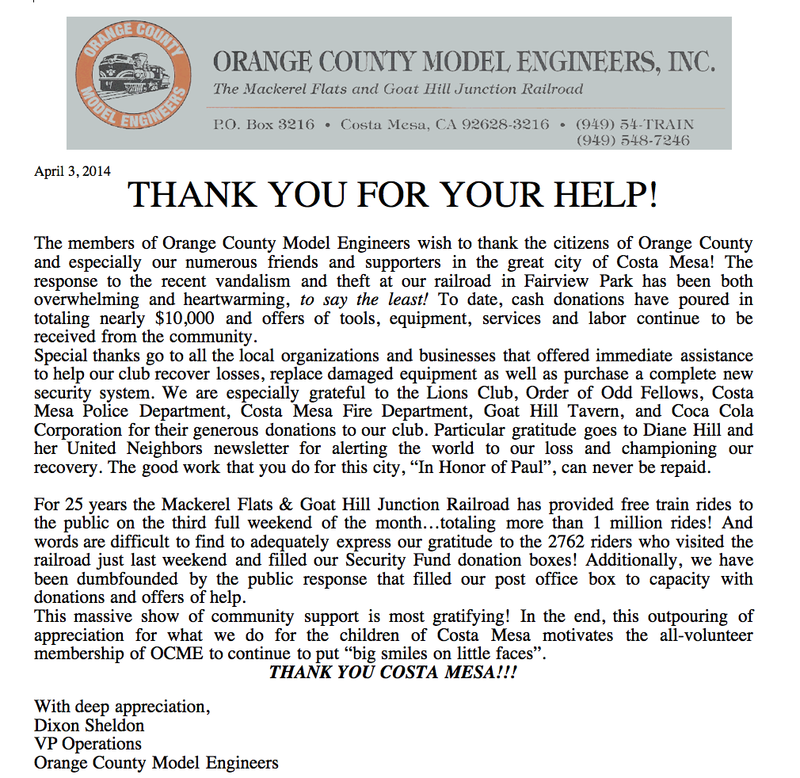 In a letter distributed this afternoon the Orange County Model Engineers thanked the Costa Mesa community for its tremendous response to their needs in the wake of a wave of vandalism and theft that has happened recently at the OCME facility at Fairview Park. Here's the letter. Click on the image to enlarge it. A BIG "BUBBLING CAULDRON" THANK YOU, TOO! I want to add my thanks to you all for your outstanding community spirit and support of this wonderful organization. 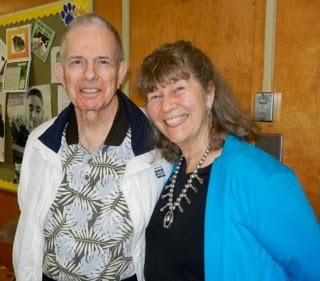 And, as Dixon Sheldon said, express my gratitude to Diane Hill for her tireless efforts honoring the memory of her husband, Paul with her United Neighbors effort to inform the community of important events throughout the city. 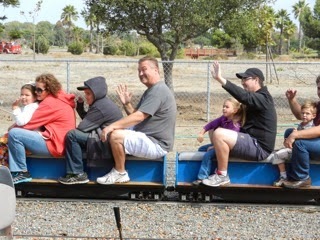 That OCME group really has put a lot of time and their own money into that project, which is truly for the kids (of all ages). It means as much to them to be able to do what they do as it is for us to enjoy it. Diane Hill also, is tireless. I've never seen anyone work so hard. A huge community asset, to say the least. I hope they will be around for a very long time for everyone to enjoy. My support of the OCME group is unequivocal. I gave chief Ghazsi a check for them, and, though my only source of income is that fat Social Security emolument, it was substantial. Watch out, though, citizens. Even with Gary Monahan's support at city council, the OCME lease on "eighty million dollars worth of Fairview Park" was only renewed for five years... If "Da Mare" gets reelected in November, there is some chance he could still evict OCME. And if the vandals are caught, I think it would be a good idea to resurrect the stocks as punishment -- vandals should be held up to public scorn for a good long time. The same should be done for nutcases who are stupid enough to sue our cops -- That's vandalism, too.